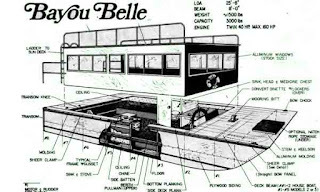 I am always looking at house boat plans as a woodworking project. I have always had an interest in boat building, even tried making my own kayak boat plans once. 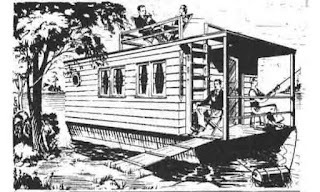 Surprised to find pontoon houseboat kits and build your own houseboat kits. 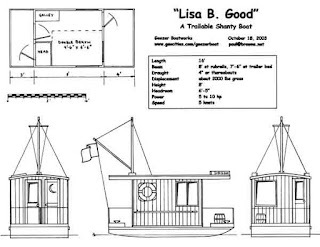 Some of the DIY boat house plans are free, some are available at reasonable cost. 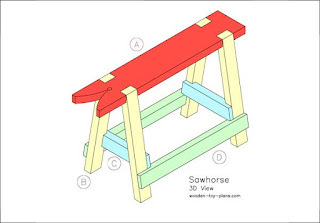 We have included a few ideas for those who would like to make their own designs. 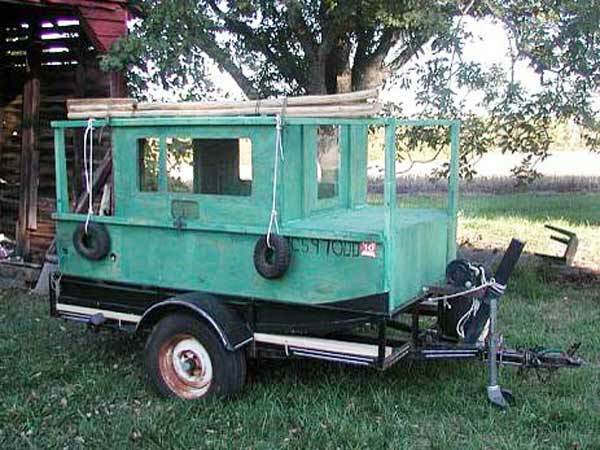 Building a day trip or weekend shanty boat is not that difficult, even if you have no experience in woodworking or carpentry. It's a great project for the family, built by the family. Everybody can become involved, from designing, building, painting, making curtains and cushions, fetching tea and snacks, making helpful suggestions or even just getting in the way. It will have to include a bed for overnight stays for sure, a fridge of course, a RV style toilet naturally, a barbecue why not. A little home from home for a weekend away. 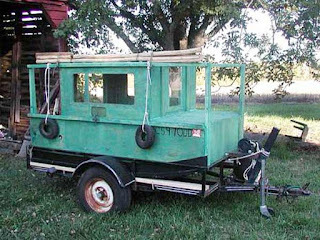 Ok, so it would have to be a shanty boat, but with a bit of class. 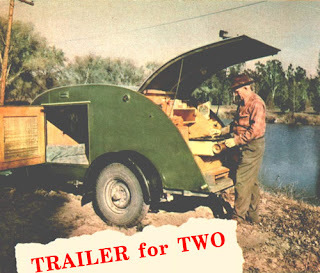 It would be nice to have it trailer-able, but that is not so important. Because it will be used in very sheltered waters, a flat bottomed scow, mono displacement hull or pontoon would be the best option. The Lisa B. Good is a 16 foot trailerable shantyboat for calm waters designed by Paul Browne as the result of a discussion on the Yahoo Shantyboat Group. Download free printable PDF plans featuring construction notes and detailed sketches. 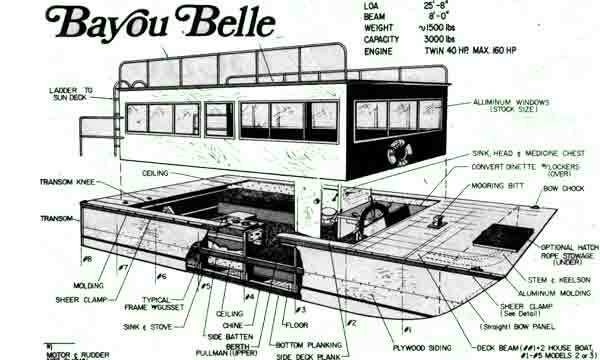 The Bayou Belle is a versatile 25 foot scow that can be built as a sports utility, a fishing boat or a houseboat. 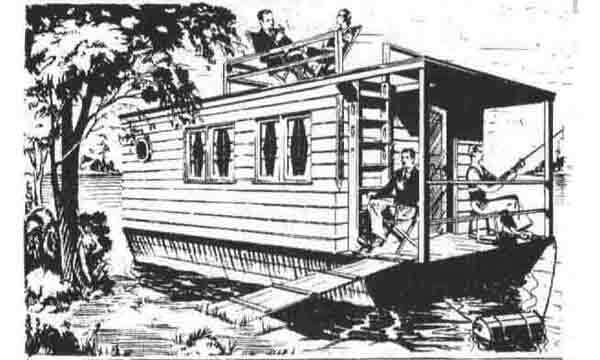 Coolwater Houseboat sketches and construction notes from Modern Mechanics Publishing Company. 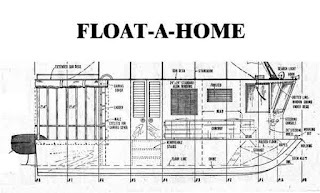 Float-A-Home is a 21 ft houseboat that is very stable and very easy to build. Free print ready download includes detailed sketches, materials list and construction notes. 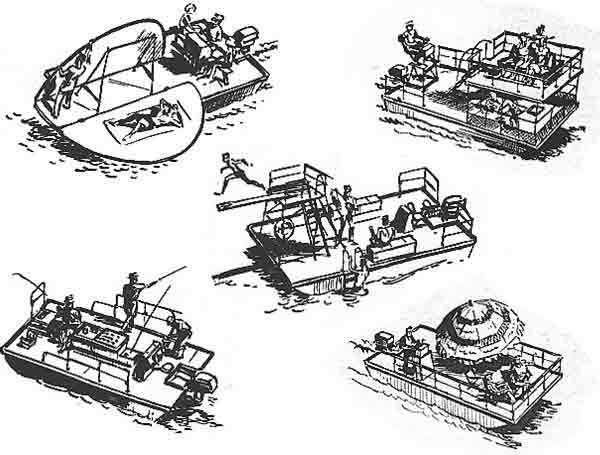 From the 1972 Boat Builder magazine. 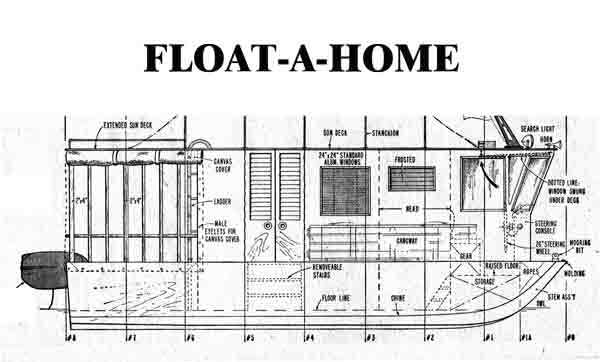 Easy to build Platform Boat plans feature construction notes, detailed sketches and photographs. From Duckworks Boat Builder's Supply.